…Until you leave, and then I’m a seething, jealous jerk that will spend all of our time together eye-balling your growing midsection and coveting it for my very own. Sorry, just being honest, which is probably for the best since that last statement clearly broke more than a few commandments. Ninety-eight percent of my friends and of-age family members have babies. Some of them even have more than one… *GASP! * My younger brother, not content with wedding-jacking me mere months before my own nuptials, totally baby-jacked me as well. Last year alone, I counted almost forty pregnancy announcements on my Facebook friends list (I clearly have too much time on my hands…), and this year is off to a good start as well. There is something in everyone’s water but mine, apparently. Now don’t get me wrong, I love those babies. My nieces and nephews, honorary and biological, mean the world to me, and my friends’ kids’ pictures are what keep me on Facebook long past my bedtime. I am truly happy when anyone I know announces that they’re expecting. I just can’t always control the bitterness that comes later. I know, I know… Thou shalt not covet thy friend’s baby bump! They say it’s healthy to have feelings of disappointment or inadequacy after hearing that your loved ones are reproducing. 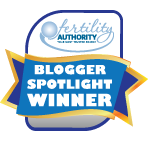 Infertility can be terribly isolating, and it’s important to know that you’re not alone… blah, blah, blah. The cold fact of the matter is that even though there are millions of other women out there feeling the exact same thing right now, it doesn’t stop me from feeling alone and angry and jealous, and then guilty about my jealousy. And then I eat a pint of ice cream to make it all better. I know that my friends would gladly give me their kids if I made an offer on the right day, and I know that one day when I do manage to spawn my own little likeness, they will all be the most gracious and congratulatory people you’ve ever met. They might even throw me a parade, just so I’ll stop talking about it. I guess what I’m trying to say is that I don’t want to be treated like an invalid just because I’m barren as the desert is dry. I love you and your kids, current and future, and I will throw you baby showers and coo over your squishy little bambino the same way I expect you’d do for me. I would never want to offend anyone (accidentally). My bitterness isn’t anything that should be taken personally, and I swear that I’ll try to keep it contained to home and husband. Poor guy. However, I’m not going to promise that I won’t still eye-ball your belly. Baby bumps fascinate me, and I will have one for my very own. I know you’re not like that in person. I wasn’t either. It tore me up inside, though. I can’t tell you how many times I cried because I found out someone else was pregnant. It seemed like everybody who wasn’t trying was pregnant in a heartbeat & I’d tried for years with no luck. You said so much of what I’ve said in the past 2 years… even the wedding-jacking/baby-jacking part. I’m officially addicted to your blog. Yeah, I feel that way with baby announcements on FB.